You have only 11 moves. This level has medium difficulty. 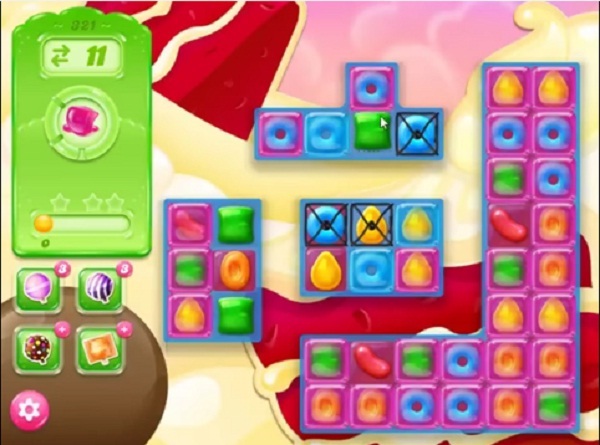 For this level try to play more from bottom part of the board to shuffle the candies and make striped candy or any special candy that you get. Combine striped candy with other special candy or play near to jelly to spread them to near candies. 1 jelly left as described, now what?? I was playing on my phone and it always left one candy on the board, but when I played on my tablet, I cleared the board on the first try. I am also one jelly shirt for the last move on level 321. Please fix for me. I can’t go any further. I have also been wasting my prizes that I’ve earned. Thank you!! Same here, on my tablet (iPad) and on my iphone I have one left, making the same moves. I will try other devices, but this is an issue, clearly. Someone should let the developers know. level 321 1 square on last part will not get jellied !!!!! HELP !! Same here.. can’t pass this level, always leaves one jelly unfilled. PLEASE FIX!! Same prob as everyone else. please fix or at least give a way to skip. Very frustrated. By reading previous comments verifies that im not going crazy!!! That 1 damn squate e ery time!!?? ?